Leaves: Basal, odd-pinnately compound, 4 to 7 inches long; leaflets 7-19, linear to narrowly oblong, .25 to 1.5 inch long, less than .25 inch wide, silvery-white with minute ax-shaped hairs; margins entire; tips pointed. Inflorescences: Racemes, 2 to 4 inches long, 6-25-flowered, on stalks 2 to 12 inches tall. Flowers: Calyces 5-lobed, silky hairy, purplish; corollas papilionaceous, 1/2 to 1 inch long, reddish purple to bluish purple; banner prominent, center often lighter; stamens 10, 9 united, 1 free. Fruits: Pods, cylindric, 1/3 to 1 inch long, densely covered with silky hairs; seeds smooth, brown. Habitat: Dry upland prairies, pastures, hillsides, river bluffs, and roadsides; limestone, sandstone, and shale soils. Comments: Purple locoweed is poisonous to livestock; it is usually eaten only when other forage is unavailable. Horses are particularly susceptible and become addicted after consuming it. The toxic effects are cumulative and can be passed in milk. Symptoms include: depression, staggering, listlessness, lack of coordination, nervousness, dull staring, weight loss, and isolation. 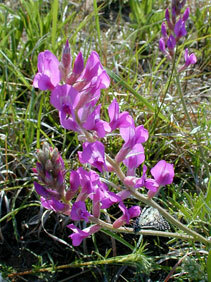 Purple locoweed is the most widespread Oxytropis species in North America.